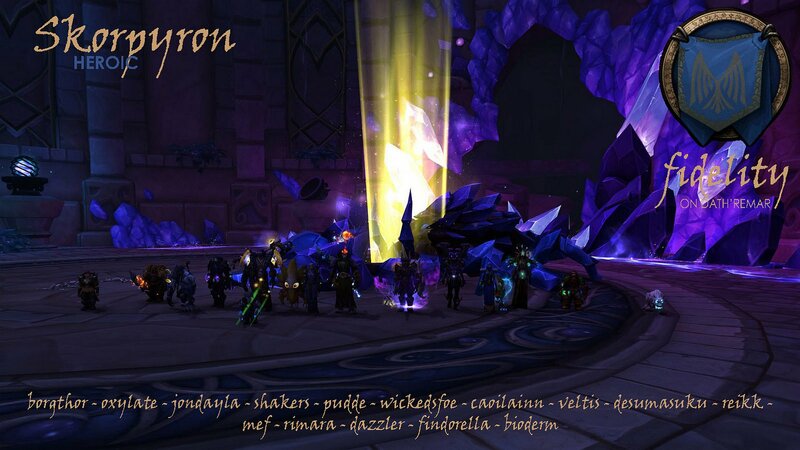 We killed Skorpyron on heroic difficulty in the first week of Nighthold opening, with 15 characters and an average iLvl of 879.3. Taking a little longer to kill than a couple of subsequent bosses at 15 attempts, we managed to sneak in the kill while also working our way through normal mode. We grouped up the Crystalline Scorpids with the Volatile Scorpids and while Esta was keg smashing, exploding kegs and heavy (fire) breathing… we had some AoE in the form of Ret Pally, Fire Mages and Beast master (not survival (never (ever) survival))) hunter ripping them apart. Of course everyone was on the adds, but those specs were the highlights for our composition on our first kill. It’s adorable that even our rogue, Desu, tried to help by flinging a teeny, tiny fan of knives and a poison bomb at the adds. Aside from dealing with the adds in a timely fashion the key to the fight was dodging Focused Blast, and hiding behind the Chitinous Exoskeleton for Shockwave. We also used heroism on the second Exoskeletal Vulnerability, and prioritised DPS into the boss over adds while vulnerable. One last factor worth noting, is that even while grouping up the one scorpion that makes the other scorpions go crazy, I (Protection Warrior tank) needed way more external healing than Esta.